Well then. Knitting. I've done it. Lovely stuff to work with. 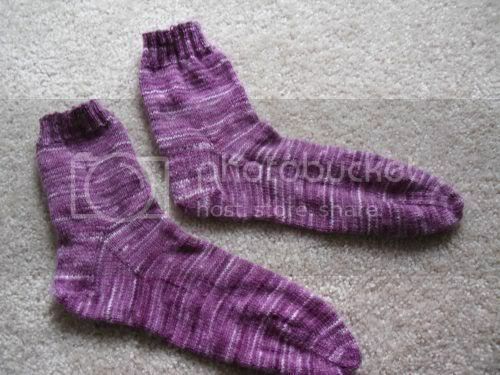 However They didn't ease the pain of the Kai-Mei socks so I then grabbed some hand spun and knit a scarf. I think it's Lorna's Laces Roving. 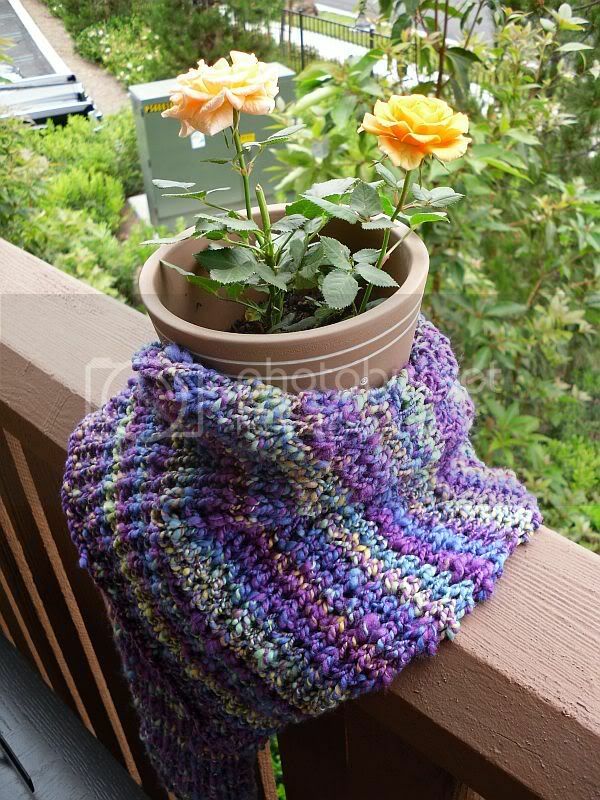 Anyway, that also fulfilled my 101 in 1001 to knit an item from hand spun. Not sure what to do with it per say. it's not really my style or anything but It's short (yet wide) so I don't know that it'll fit any adult I know. Ah well. I've also fixed the kai-mei socks but I'm getting to the toe bit and really don't want to mess it up (again) so I'm going to have to wait until I can go to Monday knit night and get some help there. So for the duration, I've started on another pair of st-st socks in a forgotten colorway by Yarn Pirate. It's all blues, grays and silvers. I've had that material for years with the specific purpose of making a needle roll and I finally finished it. :) All projects of which are stash busting. How awesome is that? I'm not going to post about anything else today save for the SUPREMELY AWESOME SWAP PACKAGE I got LAST FREAKING MONTH. It was for the Loopy Ewe Spring Fling Swap and I got it right before Matthew came home. 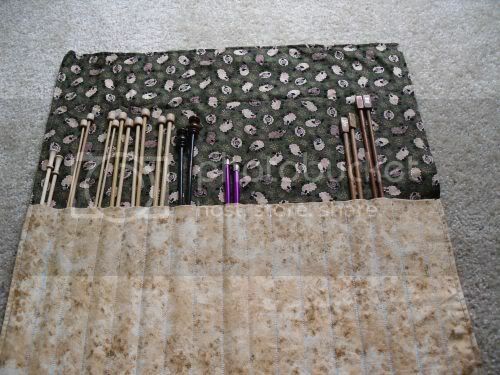 You remember how much I blogged then right? Well, then the Fling came along and I got to meet my AMAZING partner LynnZimm (Rav Link). But (hangs head in shame) I still hadn't blogged about it. Then I moved. Then this and that and a whole bunch of other life-getting-in-the-way things. SO. I'm sorry Lynn, please don't hate me (and that bag I made you? It's somewhere in the boxes-I didn't forget). Gorgeous Roving! 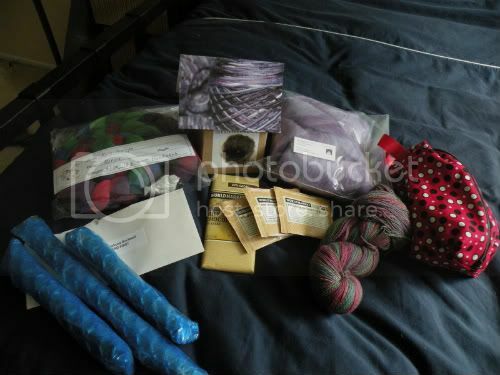 ; The green/purple/blue is Kaleidoscope by Freckle Face Fibers and the purple bag of holy goodness Merino w/ sparkle. I'm saving this and not spinning with it until I'm really good. (Trust me, in the next post you'll see). Yarn; Yeah , she spun that. It's simply amazing. It's so even and perfect. I am so eternally grateful I didn't spin up any to give to her (I just bought some) because she is amazingly perfect (and I'm not exaggerating in my shame, I said do to her face-so there :P) and, and...it's so EVEN! I bow down. The red black and white bag; She made that too. She gave it to me at the fling actually, and it's next to my red Ladybug spinning wheel holding my spinning supplies. There's an adorable sheep felting kit as well as delicious chocolate (I held on to that until the hus-beast started eying it after he ate all his chocolate he brought back from Germany), tea (completely gone)and the adorable yarn card. But seriously? The best part; the blue bubble wrapped sticks. She gave me a portable niddy noddy! OMG! I shrieked so loud when I saw it that the cat ran out of the room. My brain went sploody and I started babbling at my mom-who I might add looked at me like I was crazy... (a niddy noddy? That's nice dear). She does, thankfully, get my brand of crazy-ness. So Lynn, thank you so much again for the lovely swap package. And I'm really, horribly, sorry it took me forever and a day to blog about it. I've been quilting because, quite frankly, my knitting is ticking me off. More so today than yesterday. Anyway, yesterday I went to my moms and we went to various quilt shops looking for material for two baby blankets I need to make. 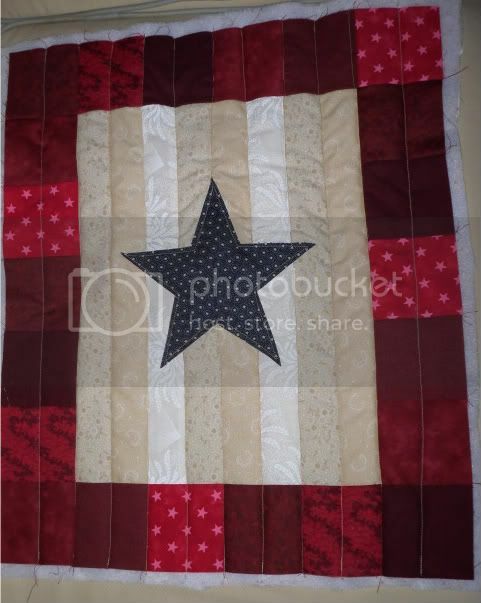 Afterward we went her her house and I started on a wall hanging kit I've had for years and jsut never did. And by years I mean since before Fall 2006 since I bought it before I knew how to sew. Taaa Daah! All that is left is to do the binding and a strip of material so I can hang it and it'll all be finished! I've also completed my st-st cashmere socks and started a scarf in hand spun since those bloody socks that shall not be named are in knitting purgatory until they've learned their lesson. The hand spun scarf, henceforth called the "Crazy Lady Scarf" is going to be very colorful and well, crappy. But it's an easy two row pattern repeat and my hand spun isn't at a decent level or consistency yet. What else would I do with it? And it's taken the rage off from knitting. Gah. So I've been nesting more so than knitting lately. Although, since last week I have picked up the needles but for 2 weeks, I had ZERO (no, I'm not lying)projects OTN. I guess my creative energy only has enough to go around for one project at a time and moving, decorating the house and getting through finals was simply too much for it. Not to mention cooking, cleaning and baking. (Smiles) However, finals are DONE, and school is DONE...er, for a month anyway. Then I'm back in for an intensive Latin course-a years worth of Latin in 9 weeks. Ahem. No I'm not crazy per-say, but it'll put me ahead of schedule by a year. That is, if the school doesn't drop all the freaking courses I need. Classes are scarce and I don't even have enough for 12 units (Have to take them in a certain order) Bah. Don't get me started on them raising tuition by $300 either. But Knitting! Yes knitting! I started on Cookie A's Kai-Mei from Sock Innovation (In DyeDreams Sox (LOVE! Mad crazy LOVE!) and I am having a heck of a time. So, in between knit nights when I get help on the blasted things, I'm also working on a pair of Cashmere st-st socks and they are DIVINE! Really, the heavens parted and the angelic chorus sang. Ahem. I'm on the second sock of those (still the first on Kai-Mei) and once I finish that I'm either going to CO the Shetland Triangle Shawl or the Dream in Color Shrug. (All rav links btw) The Shetland Triangle is going to be done in the Sundara Yarn Silky Merino Aran and the DIC in DIC Classy (Tea Party). I've knit night tonight and then home to bother and pester the hubby. :) I hope you all have a lovely day! 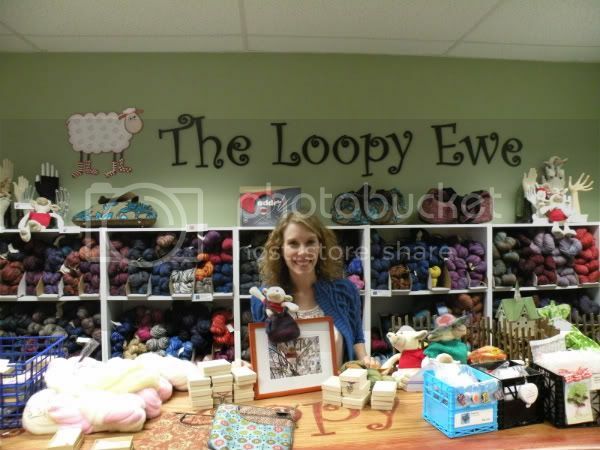 Here is myself at Loopy Central!! It was fantastic! 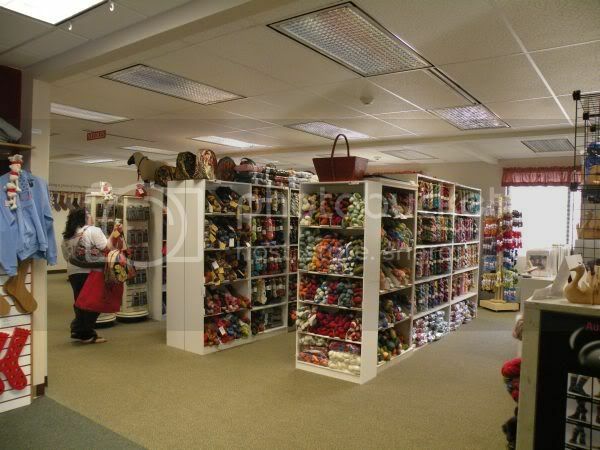 Oh Man, there was so much YARN! (drool) And to be quite honest, for an ONLINE store, it's much nicer than many brick and mortar stores. 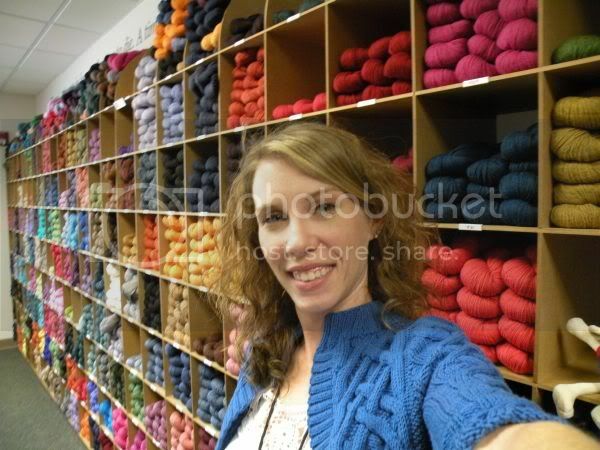 Here is the WALL of Cascade 220. I refrained since my LYS carries a huge ammount (and I don't felt enough of the stuff I have). The Loot. 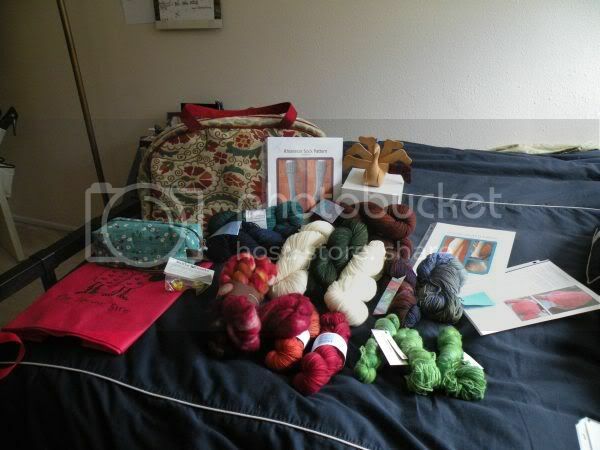 :D There is Fleece artist, Dream in color (Classy and smoochy), malabrigo lace, and Antenti bag (a story will be given in the next post since that is so worth blogging about and patterns and so much more! So right as I got home, we had to pack up everything in the house because we moved into our own place again. I'll have to get pictures for you once it's all done. :) I enjoy moving. New places, people, sights etc.. but still close enough to family, friends and good yarn stores (though I'd totally move to St. Louis for the Loopy Ewe). More to come!